Until Hugo came along in 1989, Hurricane Hazel (1954) was the strongest storm ever to strike the South Carolina coast. Thus it is fitting that a man from the Palmetto State should be the mighty storm’s namesake: right fielder Bob Hazle, who hit the National League with a bang late in the 1957 season. Although that season with the Milwaukee Braves was the highlight of Hazle’s very brief major-league career, it is still remembered by sportswriters today. Over a span of 134 at-bats, he hit .403 and helped propel the Braves to the pennant and a World Series victory. Robert Sidney Hazle was born in Laurens, South Carolina, on December 9, 1930, but grew up in nearby Woodruff. His parents, James Roland (J.R.) Hazle and Ella Belle Bishop Hazle, had six children. In addition to daughters Margaret and Azile, there were four sons: James, Paul, Joseph, and the youngest, Robert. Paul and Joe also signed professional baseball contracts. However, Bob was the only one who made it to the majors; Paul played in the minors from 1944 through 1947 and Joe from 1947 through 1955. Bob starred in four sports at Woodruff High School – football, basketball, and tennis in addition to baseball – and earned 16 letters before he graduated in 1949. In addition, Bob played ball in the American Legion and in a South Carolina institution, the textile league. He was with teams for Mills Mill in Woodruff – where his father worked – in 1947 and Watts Mill in Laurens in 1946 and 1949. (Catcher Sammy Taylor, three years younger than Hazle, also graduated from Mills Mill to the majors.) Hazle’s favorite sport in high school was football, and he had a scholarship offer from the University of Tennessee, but quit after a few days in favor of baseball. He attended Wofford College in Spartanburg, South Carolina, for one semester, but then chose to sign a pro baseball contract instead. To a boy growing up in a poor family, the bonus money of between $6,000 and $8,000 sounded very attractive. 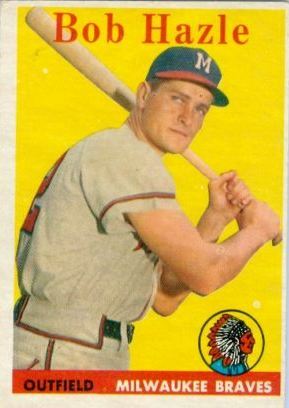 During his initial period in the minors, Hazle played for the Tulsa Oilers (1951, 1953), the Indianapolis Indians (1954), the Nashville Volunteers (1955), and the Wichita Braves (1956). He made the Texas League all-star team in Tulsa in 1951, and the Reds called him up after the major-league All-Star break, but Uncle Sam got to him first, and Hazle spent part of 1951, all of 1952, and the beginning of 1953 in the Army. He was stationed at Fort Jackson, near Columbia, and was able to play a lot of regimental baseball. The Reds called him up for spring training in 1954, but it didn’t work out. Hazle remembered this as the time things began to go a bit sour for him. He wasn’t getting much playing time. Even though he had hit around .300 with Columbia and Tulsa, he was doing a lot of sitting. And then there was that stint in the military, which came at exactly the wrong time in his career. As he said, “When you get down, especially in the minor leagues, it’s hard to get back up.”2 As a minor leaguer, he had a batting average of .287, an on-base percentage of .338 and 249 RBIs – but the 1954 season in Indianapolis was his worst (.224-4-23). It was while playing winter-league ball in Venezuela in 1954 that Hazle first earned the nickname “Hurricane.” (That October the Category 4 Hurricane Hazel had struck the US coast near the border between North and South Carolina.) In 1955, while playing 150 games for the Nashville Volunteers, Hazle batted .314. But while he had never hit for much power before, that year he hit 29 homers and drove in 92 runs. The Reds brought him up to the majors, and he hit a single to center in his first at-bat during his major-league debut on September 8. He played in six games for Cincinnati before the season ended. “The Milwaukee Braves’ rookie outfielder has stunned the baseball world with his outstanding hitting since he was recalled a month ago from Wichita. He owned a modest .279 batting average at the time. The 26-year-old left-handed hitting South Carolinian has made thirty-four hits in sixty-seven times at bat for an average of .507. …‘It doesn’t seem possible that anyone can keep up such a pace,’ said Red Schoendienst …‘but right now the kid is Stan Musial, Mickey Mantle and Ted Williams all wrapped in one.’ … Some say he simply is an overnight sensation. … Others, such as Andy Pafko, the Braves hard-hitting flychaser, say Bob is a natural hitter. ‘The kid can really rip the ball,’ Pafko said. ‘Next to Henry Aaron, he’s got the strongest wrists in baseball. And he doesn’t swing at too many bad balls, either.’ ”6 Hazle’s teammate Frank Torre said, “He looked like the best hitter in the world. … He never got fooled.” And Eddie Mathews credited him with winning the 1957 pennant for the Braves.7 Hazle ended the season with a .403 batting average in 41 games. He hit seven home runs and had 27 RBIs. His slugging percentage was .649. After playing winter ball in the Dominican Republic, Hazle rejoined the Braves for spring training in 1958, but was hit in the head by a pitch from Tom Morgan of the Tigers. Then early in the season he hurt his ankle sliding into second, and was then beaned again by a pitch from Larry Jackson of the Cardinals. He was hospitalized for a week or so, and his equilibrium was thrown off a little. In May of 1958, the Braves sold him to the Detroit Tigers for $50,000. According to the Chicago Daily Tribune, “The deal climaxed a disappointing spring for Hazle, who helped propel the Braves to a National League flag last season by hitting .403. His 1958 batting average with the club had shrunk to a mere .179.”10 Jack Tighe, the Tigers’ manager, used Hazle to relieve the ailing Al Kaline, and at one point he was hitting .300. But Tighe was fired on June 10, Bill Norman took over, and Hazle was once again riding the bench. He played in 43 games for the Tigers, and had a .241 average in 58 at-bats. His last major-league appearance was with the Tigers on September 28, 1958. Over his major-league career, he played in 110 games and had 261 at-bats and a batting average of .310. He hit nine home runs and batted in 37 runs. Foster, Jim. “Bobby Hazle Glad He Chose Baseball,” Spartanburg (South Carolina)Herald, August 16, 1957, 14. “752 Woodruff Fans Send Bob Hazle Good Luck Wire,” Spartanburg (South Carolina) Herald, October 2, 1957, 1. “Woodruff Welcomes Home Bob Hazle Today,” Spartanburg (South Carolina) Herald, October 19, 1957, 8. Cole, Bob. “Hazle Had Torrid Year for Braves,” The State (Columbia, South Carolina), April 28, 1992, 1C. “Hurricane Bob Hazle, Retired Pro Baseball Player, Dies at 61,” Charlotte Observer, April 27, 1992, 5C. Paul Hazle obituary, The State, July 4, 2009. Perry, Thomas K., Textile League Baseball: South Carolina’s Mill Teams, 1880-1955 (Jefferson, North Carolina: McFarland and Company, 1993). McGuire, Mark and Michael Sean Gormley. Moments in the Sun: Baseball’s Briefly Famous (Jefferson, North Carolina, McFarland and Company, 1999). 1 George Stone, Muscle: A Minor-League Legend (Haverford, Pennsylvania: Infinity Publishing, 2003), 194. 2 Lee Heiman et al., When the Cheering Stops (New York: MacMillan, 1990), 161. 3 Heiman et al., 162. 4 Howard M. Tuckner, “Rookie is Hitting .507,” New York Times, August 30, 1957, 13. 5 David Lamb, “Hurricane the Hero.” Milwaukee Journal, September 4, 1987, 3C. 7 Bob Spear, “1957 a Magical Whirlwind for Hurricane Hazle,” The State (Columbia, South Carolina), July 26, 2004, C1. 8 Heiman et al., 158. 9 Heiman et al., 166. 10 Chicago Daily Tribune, May 25, 1958, A2. 11 Heiman et al., 168. 16 Heiman et al., 170.